Every BHS student has an Illuminate account that they can sign into using their student email account (via Google). Please encourage your student to use it regularly! We encourage all parents/guardians to join Illuminate Home Connect! 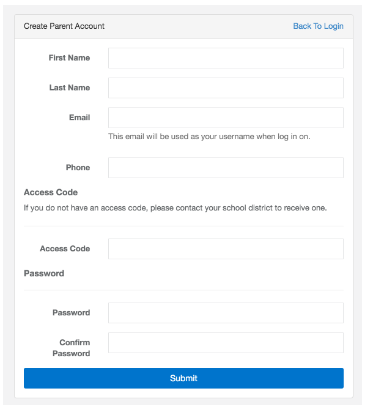 This is the portal for parents/guardians to view grades, assignments and attendance data as well as provide the high school with important contact and emergency card information. 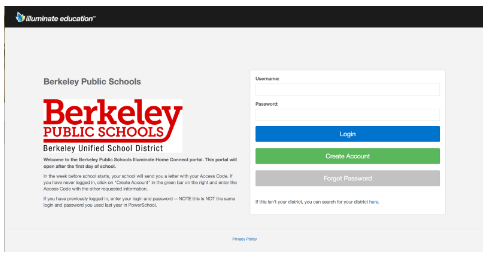 New: Note about Emergency Card Forms for Berkeley High School: Emergency card forms posted to parent Illuminate accounts on August 21, 2018. Please set up your account so you will be able to access the form when it is posted. Answers to Frequently Asked Questions about Illuminate and the emergency card can be found by following the link at the bottom of this page. If you are having difficulty getting your code, contact the Parent Resource Center at (510) 644-4814. The first time you visit, click on Create Account (in Green). To look up your personal access code, you need to be sure you are entering specifically what is asked for: student ID, student’s last name, parent’s first name, and just the street number of student’s address. Once you’ve logged in, please do not worry if your student is listed at their prior school of attendance. This will resolve itself on the first day of school. There are a few cases in which siblings do not appear together in the same parent account. If you find this to be the case, please send an email to illuminatehc@berkeley.net including all of your students’ names, school(s) of attendance, and grade and let us know. If you already have an Illuminate account you can log-in here. Your username is your email address and, if necessary you can use the “forgot password” button to reset your password. Thank you for your patience as we work to get all families connected. 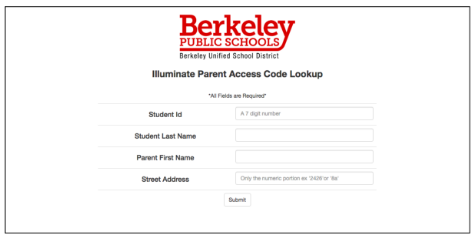 If you continue to encounter a technical issue in trying to set up your account, please email illuminatehc@berkeley.net or contact the Parent Resource Center for assistance at (510) 644-4814.